It’s the simplest things that make your life count, like a simple wish. Happy Birthday! One year older means one year better. 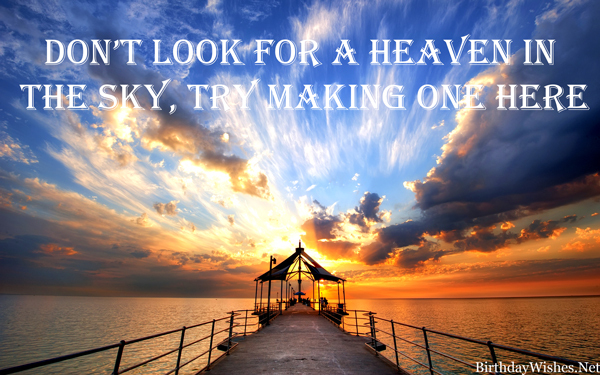 Don’t look for a heaven in the sky, try making one here. Age is a number, but life is the calculator. Wishing that you will always continue to inspire us all in good and bad times. May you always keep giving us profusely the largest smile of urs.Happy Bday! The first mark of aging appears when you start forgetting things. In your case there are no such problems. You have transcended all the hassles. Wow it’s amazing, you don’t look older, you certainly haven’t matured all that much, you don’t look smarter or more wise, but if you say that you’re a year older I’ll believe you. Happy Birthday. There’s a difference in growing old and growing old well, and all the time i’ve known you i’ve realized that you are the kind of person that knows how to grow old, and how to live life to its fullest. Thanks for all the memories that you have given me, and it has been a pleasure always being in your company, I hope you continue to grow and prosper and always stay happy like you do. Happy Birthday. There’s a difference in growing old and growing old well, and all the time i’ve known you i’ve realized that you are the kind of person that knows how to grow old, and how to live life to it’s fullest. Thanks for all the memories that you have given me, and it has been a pleasure always being in your company, I hope you continue to grow and prosper and always stay happy like you do. Happy Birthday. When I woke up today I noticed a peculiar thing, the world appeared brighter, the birds were singing, the sun was shining and everything was brilliant with the world. I thought hard for a moment why that was, and I realized that I was very happy today, because it was a special day, did you know why I was so happy, because it was your birthday. Our friendship is the best thing that ever happened to me thanks for being a part of my life. And with all my heart i wish you a Very Happy Birthday. So it’s been another 365 days of happiness and joy, sorrow and tears, we’ve made a lot of new memories both good and not so good, but there’s one thing I want to say, I wouldn’t trade the time I’ve spent with you for anything in the world. The moment you were born was a blessed day for me, the day I met you was an ever bigger blessing. And knowing you is an honor for me. Here’s to another year of friendship well spent, and hopes that the next year brings even more joy and happiness. Happy Birthday. Another year is gone and done A moment to rejoice years ago on this same day into the world you came. You light my life with tender joy with care and tender grace my dearest friend I care for you and you’re endearing ways. Happy Birthday, May you have many more…. All the world is birthday cake, so take a piece, but not too much. – George Harrison Don’t count the years, count the wishes and all the cheers. Let your self free and enjoy your Birthday, because it’s something that comes once in a year. Today is a very special day, I’ve waited for this day for a whole year, I just want to tell you, the moment that you were born and the moment we were met, are two of the most important moments in my life, and I want to celebrate them, to share in the joy of your company both past and present. Happy Birthday. Happy Birthday. Thank you for being born thank you for coming into my life thank you for being there for me through all the good and the bad. Happy birthday may you live long and prosper may you find endless joy and a life filled with health till your last moments breath Happy Birthday it is with honor i say it was an honor to have met you and be by your side today. My Dearest Friend. Happy Birthday. 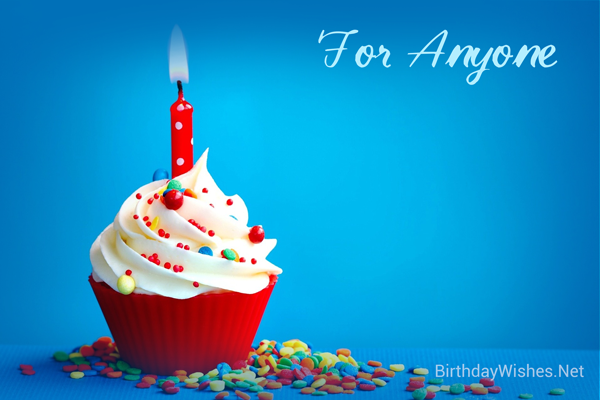 Check out this amazing collection of best birthday wishes, the best birthday wishes on this page incorporate the messages from these article, but feel free to add your own.